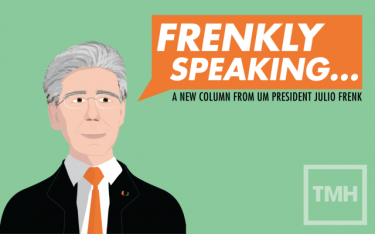 The Miami Hurricanes tipped off their season with three straight victories. In Tuesday’s season opener, the Hurricanes defeated the Florida International University Panthers, 94-43, at the Ocean Bank Convention Center. Junior Sarah Mortensen scored a career-high 24 points, hitting eight 3-pointers. Mortensen tied Riquana Williams for most 3-pointers made in a single game in program history. Redshirt junior Beatrice Mompremier recorded a double-double in her first game as a Hurricane, securing 14 points and 12 rebounds. Then, Friday, Miami kicked off the WNIT Preseason Tournament with a win over the Stephen F. Austin Ladyjacks, 81-60, at the Watsco Center. Sophomore Mykea Gray was dominant, tallying 25 points on 9 of 15 shooting. As a team, Miami shot 9 of 16 from beyond the arc, including a 53.3 percent clip in the first half. The Hurricanes rounded out their perfect 3-0 start Sunday with a, 75-62, victory over the Hartford Hawks. Sophomore Endia Banks sparked Miami off the bench with 11 points, seven rebounds and five assists. “Endia Banks, to me, was player of the game, especially with the courage she played with,” coach Katie Meier said. UM ended the third quarter going 11 of 15 from the field. Senior Emese Hof racked up a game-high 21 points and seven rebounds. Mompremier recorded her second double-double this season, netting 19 points and pulling down 13 rebounds. The No. 24 Hurricanes host the No. 19 Marquette Golden Eagles in the semifinals of the WNIT Preseason Tournament 7 p.m. Thursday at the Watsco Center. The Hurricanes toppled the Patriot League Preseason favorite, Lehigh Mountain Hawks, 83-62, Friday evening at the Watsco Center. 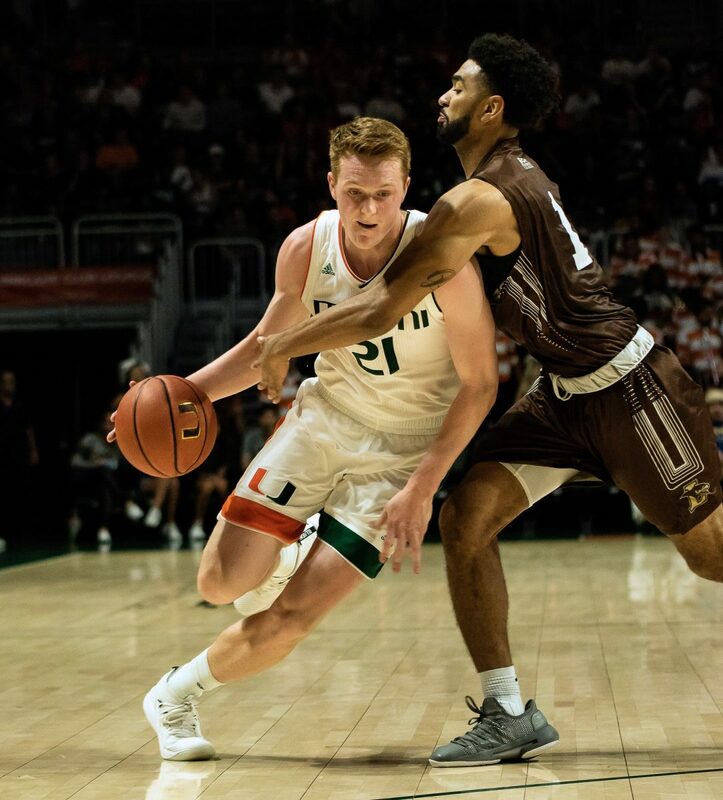 Less than a half an hour before tipoff, the Miami released a statement saying junior Dewan Hernandez will be withheld from competition due to concerns over his eligibility. Yet, the Hurricanes still put on an offensive showcase without their returning leading scorer. Chris Lykes scored a career-high 22 points on a career-best eight free-throws and four 3-pointers. Anthony Lawrence II recorded a double-double, totaling 19 points and 12 rebounds. Lawrence II also blocked three shots. Junior DJ Vasiljevic, redshirt sophomore Sam Waardenburg, and senior Ebuka Izundu joined Lykes and Lawrence II in double figures, scoring 16, 11 and 10 points, respectively. Miami will face off against the Stephen F. Austin Lumberjacks 7 p.m. Tuesday at the Watsco Center. The Canes’ late-season struggles continued with Miami dropping two road matches, extending its losing streak to four. UM started off strong, winning the first two sets over the Wake Forest Demon Deacons, but the Hurricanes couldn’t hold their lead. Wake Forest took the final three sets to defeat Miami, 3-2 in a five set thriller Friday evening at the Reynolds Gymnasium. The Demon Deacons won 25-16, 25-20, 20-25, 24-26, 10-15. Kolby Bird led the Hurricanes with a season-high 18 kills in the defeat. Outside hitter Elizaveta Lukianova recorded five kills in the first set, but faltered from there, only tallying three kills the rest of the way. Just two days later, Miami fell short against the North Carolina Tar Heels, 3-1. The Heels dominated offensively, including 16 kills in the fourth set, to defeat the Canes, 25-20, 23-25, 25-20, 25-21. Lukianova bounced back with 16 kills and three blocks, while freshman Chloe Brown notched 10 kills, three service aces and one block. Miami will try to snap its four-game losing skid against the Pittsburgh Panthers 1 p.m. Sunday at the James L. Knight Sports Complex. Adria Soriano Barrera reached the quarterfinals of the ITA Fall National Champions before coming up short against Oregon’s Thomas Lauren, 6-7 (1-7), 5-7. Soriano Barrera recorded an 8-4 mark in the fall, including a finals appearance in the ITA Southeast Regional. In Texas, the Hurricanes clinched two back draw titles at the Longhorn Invitational. Redshirt junior Dane Dunlap defeated Liberty’s Nicaise Muamba, 7-6 (7-4), 6-4, to win the flight B Blue Draw. Sophomore Tatsuki Shimamoto took the Flight D Red Draw final defeating Louisville’s Alex Westbrooks, 6-4, 6-2. No. 2 seed Estela Perez-Somarriba fell 3-6, 2-6 to UCLA’s No. 13 seed Elysia Bolton in the round of 16 at the Oracle ITA National Fall Championships. It was just Perez-Somarriba’s second straight set loss in 2018. The junior capped off her fall season with a 12-2 record, including a 6-1 mark against ranked opponents. Miami closed out its 2018 campaign at the NCAA South Regional. Abby Kittle was the first of six Hurricanes to cross the finish line with a time of 23:25 in the women’s 6K Championship. Sophomore Dylan Sykes was the only member of the men’s team represented at the event. Sykes finished his first 10K of the year with a time of 32:25. 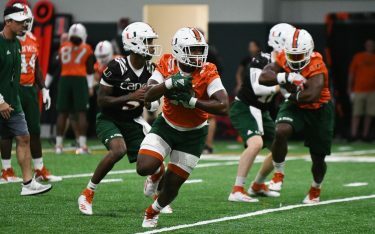 The Hurricanes wrapped up their fall season with a scrimmage against the University of Central Florida Knights. In the 1V8+ competition, UCF took first and fourth place, while UM secured second and third. The Hurricanes grabbed the third and fourth pieces in the 2V8+ competition and UCF won the first two pieces in the race.